Recently I heard about a cool non-profit organization that offers FREE tickets to Veterans and Military. 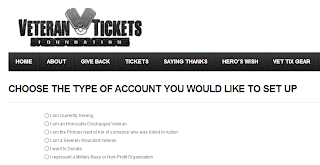 The organization is called Veterans Ticket Foundation or "Vettix" for short. They will send you an email with instructions on how to verify your account. That's it! 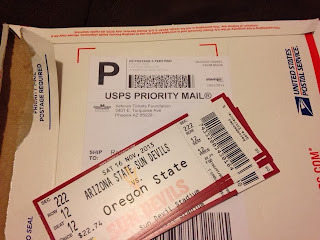 I recently received tickets from them.to a college football game. They sent me the tickets priority mail. The tickets were free of charge but they do charge a shipping fee which was like $10 for 4 tickets. Here are some Pictures from the game. Thanks Vettix! It's not free or guaranteed. You have to pay a processing/will call fee plus you have to use lottery coins and hope you get picked for the event you really want to go to. I went to the Citrus Bowl with my wife and two kids (four free tickets). Had to pick up the tickets at the will-call ticket booth, but paid no fee and used no lottery coins. Yes, there are events with limited tickets that you can choose to apply to get by paying with lottery coins, but not all events are such. Like I said. Citrus Bowl was totally free.